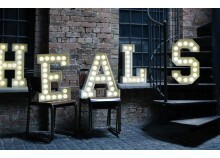 The Getfurnished.com online store offers beautiful illuminated letters of all kinds for rent. 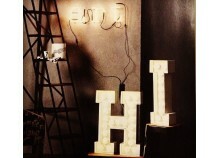 A simple contract allows you to decorate your interior with bright LED or vintage letters for a period of between 1 and 36 months. You can also change the style of decoration and choose different bright decorative letters during your contract, in order to vary the pleasures. 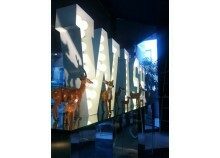 The Getfurnished.com online store is the best place to find cheap vintage lighted decorative letters or LEDs. The concept of rental allows you not to give up the comfort you dream of for your temporary accommodation for budgetary reasons. This service can also be very useful if you want to organize a party at your home, or receive friends. There are therefore many reasons for choosing to rent, and they deserve to be looked at in this new way of consumption. The luminous decorative letter is an object that finds its place in the most modern and best decorated interiors. Are you a fan of the vintage or classic trend decoration? A beautiful bright decorative letter can help you to embellish your interior while expressing your artistic sense. 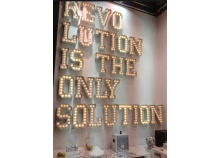 But, these very trendy decorative objects can be relatively expensive to buy: is that a reason to do without them? 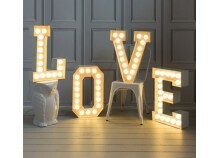 Renting illuminated letters with Getfurnished.com allows you to decorate your temporary accommodation as beautifully as you like, without having to invest large sums. - Price: The main advantage of Getfurnished.com's rental service is the very attractive monthly payment amount. Enjoy the best items without worrying about your budget. - Quality: The Getfurnished.com shop offers quality items and equipment. 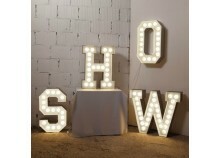 For bright letters, find all styles of letters to suit the particular decoration of your interior. High-end vintage illuminated letters, LED illuminated letters in different colours: indulge yourself with a wide variety of decorative letters. 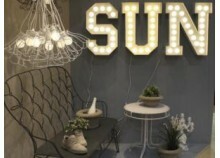 - Simplicity: Getfurnished.com's decorative light letter rental service is simple and convenient. All you need is an online choice, a simple contract, and you are delivered quickly without the need to travel.